The Hotel Riposo is a 3-star hotel located directly on the sea in Gatteo Mare. It has a garden, air-conditioned rooms, parking available and services for people with disabilities. It is equipped for cyclists and admits small animals. It is located in Gatteo Mare, facing the beach. At about ten minutes walk you can reach the Don Guanella Gardens, often home to events for adults and children. Entrance badge, independent air conditioning, flat screen satellite and digital TV, telephone, safe, newly renovated private bathrooms with shower and courtesy set, hairdryer, minibar (on request, with a supplement). Some rooms have a balcony. STANDARD : some with balcony, with external view or garden. SEA VIEW : with sea view balcony. SEAFRONT : with a balcony overlooking the sea and windows with electric shutters. Garden, sun terrace, lift, satellite TV. The structure is equipped for cyclists who are given the opportunity to store their bikes in the room. PARKING: uncovered for all customers (for a fee). AGREEMENTS : beach, pool and waterslide (Diamanti Beach Village pool with free bus). SERVICES FOR DISABLED PEOPLE : ground floor entrance with inclined ramp, standard lift, accessible room with wheelchair space and aids. Shower with chair. BREAKFAST : international, with homemade desserts. LUNCH AND DINNER : choice between three menus based on meat and fish followed by a buffet of raw and cooked vegetables. local cuisine with water, wine and soft drinks included with meals. In the hotel: strollers, paid pediatrician. In the room : cots on request, raised sides in the bunk beds. At meals : table seats, baby menu, dedicated kitchenette, possibility of baby portions. On the beach : entertainment, playground area. 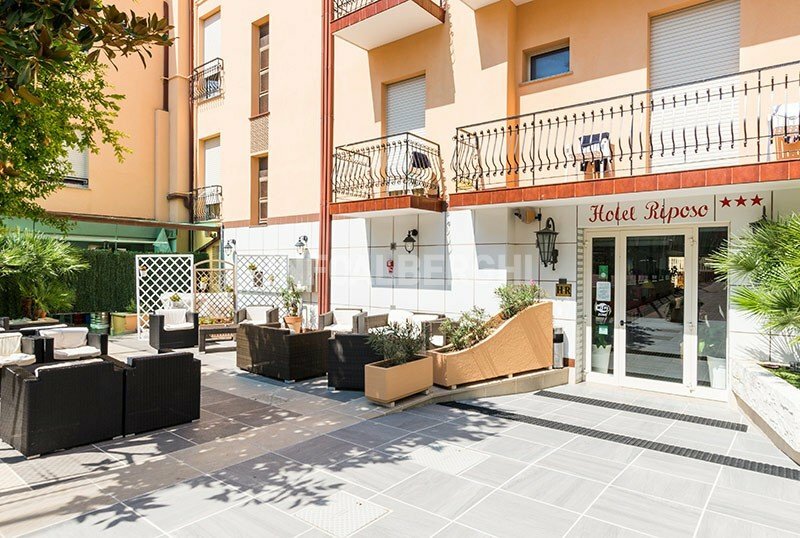 The Hotel Riposo has an agreement with the Bagno Luciano. There is entertainment for adults and children, a bocce court, hot and cold showers, a children's playground area. Prices are per day, per person in double room, full board, for a stay min. 3 nights. TOURIST TAX: not included in the price list of € 2.00 per day per adult for the first 5 days of stay. - In case of cancellation of the reservation the entire deposit will be returned up to 3 weeks before arrival.